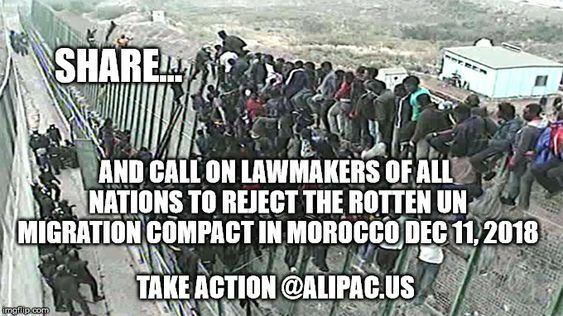 Americans for Legal Immigration PAC (ALIPAC.us) is calling on American lawmakers and the leaders of other nations to fight against and refuse to sign the United Nations Global Compact for Safe, Orderly, and Regular Migration, which will be voted on by UN members of the "International Congress" in Marrakesh, Morocco, on December 10th and 11th, 2018. While UN Migration Compact supporters claim the document is non-binding, critics argue that it uses the term "obligation" eight times, and it lays out a framework for sovereinty threatening legislation in all nations which includes the criminalization of speech by individuals, organizations, and media opposing illegal immigration. The UN Migration Compact intentionally fuses legal and illegal immigration into sovereign nations as "migration," attempting to legitimize illegal immigration while expanding the definition of "hate speech" to crack down on voices like ALIPAC's who would oppose these destructive and deadly open borders globalist policies. "We oppose the UN Migration Compact and believe that passage of that document will be used by socialist dominated Silicon Valley corporations like Facebook, Google, Twitter, PayPal and others to increase and intensify their current purge of voices from American conservatives like us who oppose illegal immigration and mass migration," explained William Gheen, President of ALIPAC. "We already have direct reports of Facebook deleting posts of the Marcel De Graaff press conference and banning users who are speaking out against the illegal alien caravans and the UN Migration Compact. A large majority of Americans oppose increased legal and illegal migration and the censorship and global tyranny embodied in the Migration Compact and by Silicon Valley totalitarians." At a October 23, 2018 press conference with Marcel de Graaff, Nicolas Bay, ENF Group Leaders, and Gerolf Annemans, Mr. de Graaff, who has been a Member of the European Parliament for the Netherlands since 2014 representing the Party for Freedom, had this to say, "One basic element of this new agreement is the extension of the definition of hate speech. The agreement wants to criminalize migration speech. Criticism of migration will become a criminal offense. And media outlets... that give criticism of migration can be shut down." -- Citizens of ratifying nations have not been asked to support and have no voice in the UN Migration compact. -- No plans in the document to resolve conflicts between the obligations of the pact and free speech rights. -- No plans to pay for the astronomical costs nations will incur trying to take in large numbers of new migrants. -- No acknowledgement of one-way migration from third world countries into first world nations. -- No safeguards to protect target nations from criminal elements, terrorists, or communicable and deadly diseases carried by migrants. -- No address of impact of new mass migration waves impact on infrastructure, schools, healthcare, and power grids of affected nations. While the compact is aggressively supported by open borders, mass migration, global socialism leaders like Germany's Angela Merkel, several nation have indicated they will be voting “No” to the Global Compact for Safe and Orderly Migration including President Trump of America, Australia, Austria, Israel, Hungary, Poland, the Czech Republic, Bulgaria, and Croatia. Citizens of America are encouraged to contact their elected officials to demand that the United States continues to refuse to sign the compact while aggressively lobbying other nations to do do the same. Citizens of other nations who value freedom of speech, national sovereignty, secured borders, and protections for domestic workers, industries, health, security, and lives are encouraged to demand their lawmakers and nations join the growing list of countries voting "No" on the UN Global Compact for Safe, Orderly, and Regular Migration in Marrakesh, Morocco, on December 10th or 11th. Last edited by ALIPAC; 12-05-2018 at 05:49 PM. Beezer, Scott-in-FL, Judy and 2 others like this. Last edited by ALIPAC; 12-05-2018 at 03:00 PM. Trump needs to start his OWN coalition with Hungary, Austria, Croatia, Spain, Poland, Czech Republic, Bulgaria, Solvenia, Australia and more countries will get on board to stop this invasion of our countries! What we need to see is Vladamir Putin and Russia say No to the UN Migration Compact. The Eagle and the Hammer should unite against these globalists. Airbornesapper07, Beezer and Judy like this.